The Environment panel allows you to configure some of the very important project parameters that affect the way data visualizations are computed. Because different environments have different characteristics in terms of signal attenuation, diffraction, reflection, etc., you are asked to Select an environment from the list. You should select the environment that best describes the site being surveyed. For each environment, the application recommends a Guess range. A guess range is the diameter of the circle for which the application predicts WLAN characteristics with a high degree of certainty. The lower the range, the more accurate the measurements, but the longer your walkabout path is. The higher the range, the less accurate the measurements, but the less time you spend performing a survey. When you conduct a site survey and click on the map to mark your location, TamoGraph displays your path and draws the guess range around the route points and your path, thus giving you a visual indication of the zone that you covered with your survey. The image below illustrates the walkabout path and guess range zone drawn along the path. It is quite all right to decrease the suggested guess range, but increasing it is not recommended for the reasons explained above. 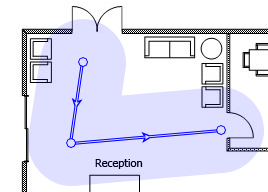 For passive surveys, TamoGraph can also compute WLAN characteristics outside the guess range zone, although such computations will have a lower degree of accuracy. Check the Extrapolate data beyond the guess range box to enable such computations. Enabling this option will mean that data visualizations will cover the entire map rather than the areas that you actually surveyed. Enabling this option is not recommended. For predictive models, you can specify the expected noise level for your virtual environment. There are two separate controls for the 2.4 GHz and 5 GHz bands. The default level is -90 dBm for 2.4 GHz and -95 dBm for 5 GHz. Finally, the Measurement units control can be used to choose the preferred units (feet or meters) for displaying distances and coordinates throughout the application.